We are Istvan Parragh and Ildiko Pataki, the owners and designers of Vodmochka Graffix embroidery design company and creators of this website. How we become embroidery designers? 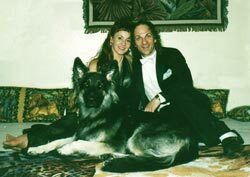 We always loved animals, especially our german shepherd, that traveled with us everywhere. After his death, we wanted to embroider his portrait on our jackets. We wanted to show his eyes, his personality as paintings and drawings do. Unfortunately we could not find anybody to do that. We decided we’ll do it ourselves. 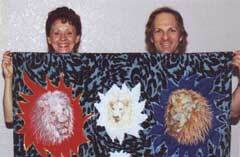 We researched, studied and created our first embroidered portrait in 1997. Since then we have converted thousands of designs to embroidery, including portraits. We won awards in international competitions; you can find links to them on this page. We both have born in Budapest, Hungary. After many years of traveling all over the World as performers, we settled in Las Vegas, Nevada. Our artistic talent was discovered at an early age by talent searches. We went through many years of vigorous training both in the physical and mental parts of the artistry. We have studied many different arts and art history, including music, performing arts, like dance, pantomime, acting, music and singing, also painting, drawing, photography, make-up artistry, choreography, stage lighting, costume design, sewing, hand embroidery, in several prestigius Artist Academy in Budapest, thanks to our generous government. If you want to learn more about us, about embroidered portraits, embroidery digitizing, please contact us.